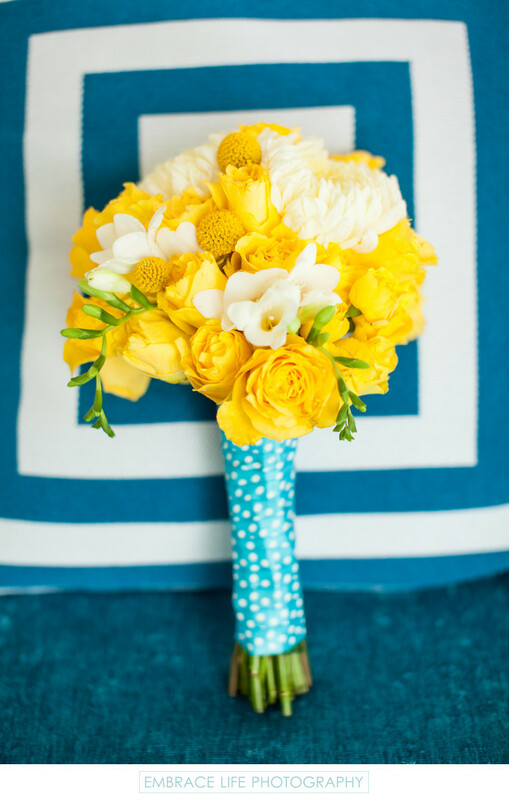 The bride's colorful and cheerful bouquet at this Santa Monica wedding photographed at Le Meridien Delfina is composed of vibrant yellow roses and billy balls, accented by a few white flowers and greenery. The bridal flowers are wrapped in a blue ribbon with white polka dots, complimented perfectly by the Santa Monica wedding venue's modern furniture including a geometric blue and white pillow and blue seat cushion. Location: 530 Pico Boulevard, Santa Monica, CA, 90405.